Why is pitch stability important? Pitch is the most important axis of stability and by it, yoke/stick feel for a pilot. It’s the axis which interplays with the all-important lift and by it, the aircraft’s speed. The most important instrument when one learn to fly is the speedometer, not the altimeter. One must have sufficient speed to takeoff and climb and keep speed over a lowest limit when landing. If not, the wings can stall and one is in serious trouble. The speed of an aircraft is one-to-one coupled with the pitch attitude. The yoke/stick and throttle are manoeuvred in unison when flying at low speed, to always keep the speed at the desired level independent of any change in altitude or climb/sink-rate. It’s important for a pilot to have a constant relation between stick pressure and the change in pitch attitude and by it Angle of Attack (AoA). The pitching moment versus AoA curve shall be a straight line, with a certain constant negative angle as the green line in Figure 1. A kink in the curve like the red line is not desired, the pilot would feel as if the aircraft suddenly pitches up faster for the same stick input. This is not a desired characteristic when flying close to stall. If this is not augmented the aircraft is classified as difficult to handle at certain situations. 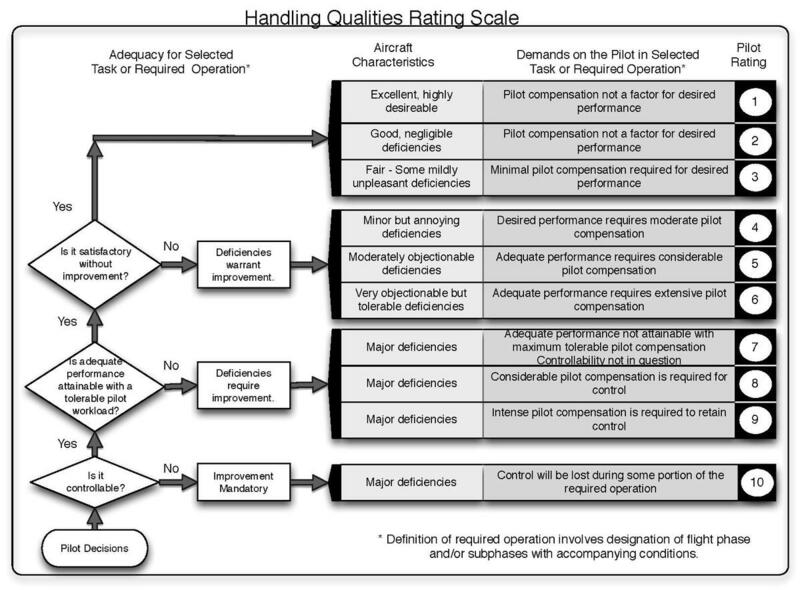 There is a Pilot’s acceptance scale developed for this consistency of feel, the Cooper-Harper rating scale, Figure 2. Figure 2. The Cooper-Harper rating scale used in test flying of aircraft. Source: Wikipedia. If test pilots from the OEM and subsequently from the FAA/EASA consider the feel in pitch for a part of the envelope below a certain rating, the aircraft will not pass Certification. It needs augmentation for this part of the flight envelope. The aircraft OEM is asked to propose fixes to the pitch characteristics of the aircraft so it can be judged acceptable for use by a minimum standard (Re. training and proficiency) pilot. This was the reason behind the MCAS pitch argumentation for the 737 MAX. In the next Corner, we will look at the required characteristics in yaw of an airliner. The speed of an aircraft is one-to-one coupled with the pitch attitude. Isn’t this only true for a constant aircraft weight? In your experience as a pilot, could you sense the difference in pitch attitude when flying empty (little payload and low fuel) at a given speed vs. flying full at that same speed? of course, it should be pitching moment, thanks. Re feeling heavy versus light aircraft. You feel the difference in inertia, which makes you apply more stick for a sought after pitch rate change but I’m not sure the pitch stick/yoke feel is so different. We have to say pitch feel would only be affected by weight in a non-boosted or partially boosted mechanically controlled pitch control aircraft. Once you are 100% boosted your feel is generated by spring loads and in FBW your feedback loops give you pitch rate or G as a function of stick force/displacement once again against a spring. Thanks for your reply which was very interesting, but I guess I wasn’t clear. I was trying to ask if you can notice the different pitch attitude when flying level empty vs. flying level full when the airspeed is the same. The AoA of the full aircraft should be greater than for the empty one. This gets to your statement that “The speed of an aircraft is one-to-one coupled with the pitch attitude.” I think it is really only one-to-one for a particular aircraft weight. OK, got it now. Yes, at low speed like after takeoff and before landing you can feel and see the difference with a heavy and light aircraft. At cruise speed no, the difference in AoA is a fraction of a degree in pitch and you don’t feel or see such small differences. But at the low speeds of final approach and initial climb the recommended speed is greater for a heavier airplane. Crew calculates it in advance then writes it down or enters it into a display (perhaps with help of fight dispatch and pre-calculated tables). Later in the climb speed may be constant at 250 knots due ATC protocol below 10,000. feet. Think the Mig29 is a bit different as it has “neutral stability”, it stays at the chosen angle of attack when you release the stick in pitch. That way it does not “diverge in alfa” but stays where the pilot puts it like a perfect pairs of Rossignol skis on a steep slope. I don’t know if it works both M>1 and M<1. A very interesting corner by Bjorn as usual. It does make me wonder if full fly by wire is inherently better than mostly manual with some automation applied. If this is true, are there any problems with FBW, possibly if the aircraft is in direct law at the edges of the envelope ? I would like to see a corner where an objective comparison between the FBW of 777, 787, A320 – A380, and the A220 is made. The safety, pilot workload reduction, and of course the view of the pilots flying these different types. I presume that all future aircraft will be FBW, what direction should this take, for instance, should all controls (where applicable) be back-driven to aid pilot awareness ? Thanks Bjorn, this filled in some understanding of the 737 MAX pitch issue for me. 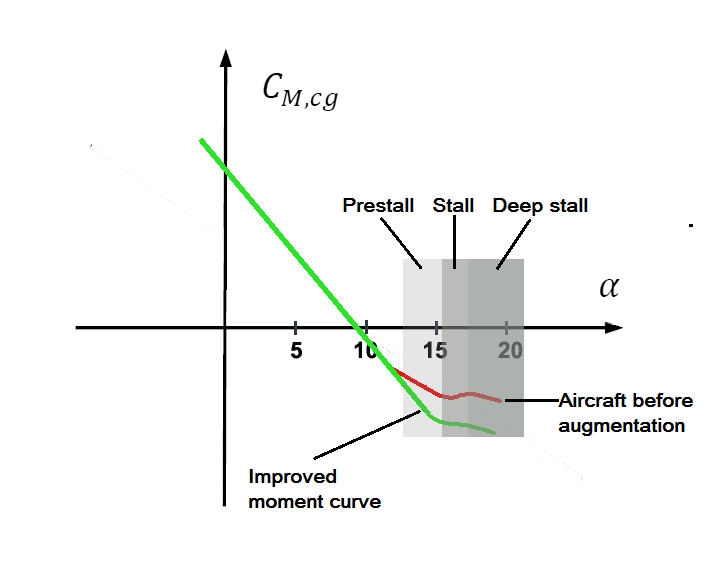 I was previously assuming that the Cm versus alpha curve actually reversed in the pre-stall due to nacelle lift, i.e giving actual pitch instability in this flight regime. I didn’t know an abrupt-ish change between stable to less stable (as you suggest) was explicitly forbidden in the certification rules though, although it seems commonsense that it should be so. Thank you for this highly detailed documentation, which provides valuable insights into the 737 Max’ aerodynamic and safety issues! Only sad that this didn’t prevent the tragedy with the Ethiopian Air a few weeks later. If Boeing had been this forthcoming with informations, it may have made a difference between life and death. Anyway, kudos to the author, who did his best to provide highly important knowledge. Don’t be discouraged, please continue with this excellent work. A question about Figure 1. above. Was this graph produced using data before, or after the Lion Air crash ? What I am trying to understand, is, does Figure 1. represent the pitch moment curve that was to be addressed by the 0.6 degrees of movement, or the 2.5 degrees of movement. If it is the former, would Figure 1. look different for the 2.5 degrees of movement figure, or would it look the same ?